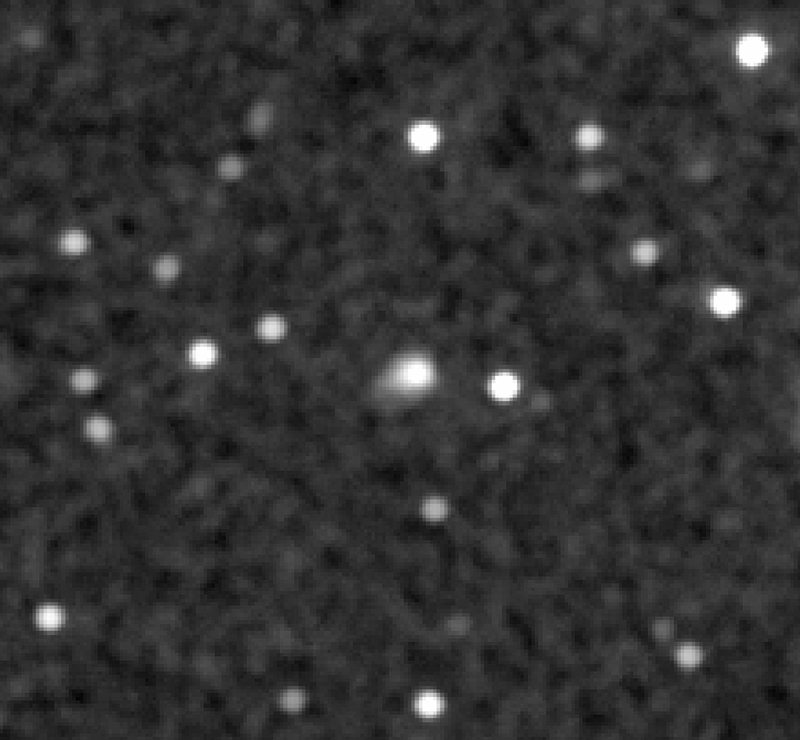 Astronomers from the University of Maryland at College Park (UMCP) and Lowell Observatory have used NASA's Swift satellite to check out comet C/2012 S1 (ISON), which may become one of the most dazzling in decades when it rounds the sun later this year. Using images acquired over the last two months from Swift's Ultraviolet/Optical Telescope (UVOT), the team has made initial estimates of the comet's water and dust production and used them to infer the size of its icy nucleus. "Comet ISON has the potential to be among the brightest comets of the last 50 years, which gives us a rare opportunity to observe its changes in great detail and over an extended period," said Lead Investigator Dennis Bodewits, an astronomer at UMCP. Comet ISON is now approaching the inner solar system. Discovered last year, the comet remains unusually active for its distance from the sun. If current trends continue, ISON could rank as one of the brightest comets in decades when it makes its close approach to the sun in late November. 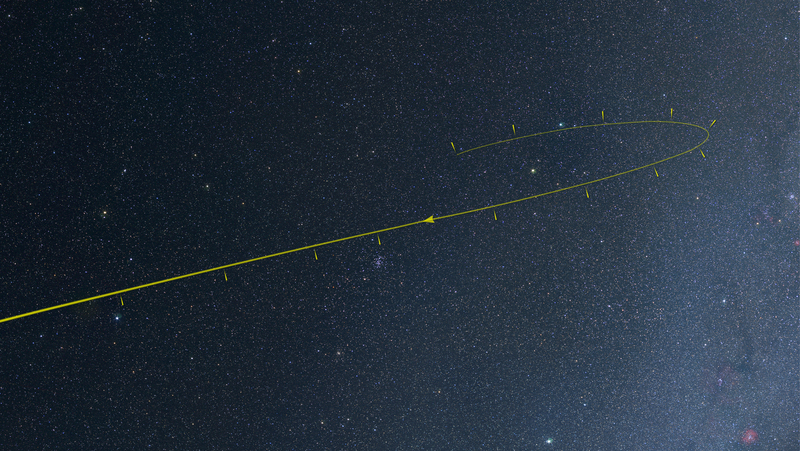 This animation shows the comet's approach and departure from the inner solar system from various perspectives. Additional factors, including an encounter with Mars followed by a scorching close approach to the sun, make comet ISON an object of special interest. In late February, at NASA's request, a team of comet experts initiated the Comet ISON Observing Campaign (CIOC) to assist ground- and space-based facilities in obtaining the most scientifically useful data. Like all comets, ISON is a clump of frozen gases mixed with dust. Often described as "dirty snowballs," comets emit gas and dust whenever they venture near enough to the sun that the icy material transforms from a solid to gas, a process called sublimation. Jets powered by sublimating ice also release dust, which reflects sunlight and brightens the comet. Typically, a comet's water content remains frozen until it comes within about three times Earth's distance to the sun. While Swift's UVOT cannot detect water directly, the molecule quickly breaks into hydrogen atoms and hydroxyl (OH) molecules when exposed to ultraviolet sunlight. The UVOT detects light emitted by hydroxyl and other important molecular fragments as well as sunlight reflected from dust. The Ultraviolet/Optical Telescope aboard NASA's Swift imaged comet ISON (center) on Jan. 30, when it was located about 3.3 degrees from the bright star Castor in the constellation Gemini. At the time of this 5.5-minute optical exposure, ISON was about 5,000 times fainter than the limit of human vision. The Jan. 30 UVOT observations reveal that ISON was shedding about 112,000 pounds (51,000 kg) of dust, or about two-thirds the mass of an unfueled space shuttle, every minute. By contrast, the comet was producing only about 130 pounds (60 kg) of water every minute, or about four times the amount flowing out of a residential sprinkler system. "The mismatch we detect between the amount of dust and water produced tells us that ISON's water sublimation is not yet powering its jets because the comet is still too far from the sun," Bodewits said. "Other more volatile materials, such as carbon dioxide or carbon monoxide ice, evaporate at greater distances and are now fueling ISON's activity." At the time, the comet was 375 million miles (604 million km) from Earth and 460 million miles (740 million km) from the sun. ISON was at magnitude 15.7 on the astronomical brightness scale, or about 5,000 times fainter that the threshold of human vision. Similar levels of activity were observed in February, and the team plans additional UVOT observations. While the water and dust production rates are relatively uncertain because of the comet's faintness, they can be used to estimate the size of ISON's icy body. Comparing the amount of gas needed for a normal comet to blow off dust at the rate observed for ISON, the scientists estimate that the nucleus is roughly 3 miles (5 km) across, a typical size for a comet. This assumes that only the fraction of the surface most directly exposed to the sun, about 10 percent of the total, is actively producing jets. An important question is whether ISON will continue to brighten at the same pace once water evaporation becomes the dominant source for its jets. Will the comet sizzle or fizzle? "It looks promising, but that's all we can say for sure now," said Matthew Knight, an astronomer at Lowell Observatory in Flagstaff, Ariz., and a member of the Swift and CIOC teams. "Past comets have failed to live up to expectations once they reached the inner solar system, and only observations over the next few months will improve our knowledge of how ISON will perform." From now through October, comet ISON tracks through the constellations Gemini, Cancer and Leo as it falls toward the sun. Based on ISON's orbit, astronomers think the comet is making its first-ever trip through the inner solar system. Before beginning its long fall toward the sun, the comet resided in the Oort comet cloud, a vast shell of perhaps a trillion icy bodies that extends from the outer reaches of the planetary system to about a third of the distance to the star nearest the sun. Formally designated C/2012 S1 (ISON), the comet was discovered on Sept. 21, 2012, by Russian astronomers Vitali Nevski and Artyom Novichonok using a telescope of the International Scientific Optical Network located near Kislovodsk. The first of several intriguing observing opportunities occurs on Oct. 1, when the inbound comet passes about 6.7 million miles (10.8 million km) from Mars. "During this close encounter, comet ISON may be observable to NASA and ESA spacecraft now working at Mars," said Michael Kelley, an astronomer at UMCP and also a Swift and CIOC team member. "Personally, I'm hoping we'll see a dramatic postcard image taken by NASA's latest Mars explorer, the Curiosity rover." Fifty-eight days later, on Nov. 28, ISON will make a sweltering passage around the sun. The comet will approach within about 730,000 miles (1.2 million km) of its visible surface, which classifies ISON as a sungrazing comet. In late November, its icy material will furiously sublimate and release torrents of dust as the surface erodes under the sun's fierce heat, all as sun-monitoring satellites look on. Around this time, the comet may become bright enough to glimpse just by holding up a hand to block the sun's glare. Sungrazing comets often shed large fragments or even completely disrupt following close encounters with the sun, but for ISON neither fate is a forgone conclusion. "We estimate that as much as 10 percent of the comet's diameter may erode away, but this probably won't devastate it," explained Knight. Nearly all of the energy reaching the comet acts to sublimate its ice, an evaporative process that cools the comet's surface and keeps it from reaching extreme temperatures despite its proximity to the sun. Following ISON's solar encounter, the comet will depart the sun and move toward Earth, appearing in evening twilight through December. It will swing past Earth on Dec. 26, approaching within 39.9 million miles (64.2 million km) or about 167 times farther than the moon. Whether we'll look back on ISON as a "comet of the century" or as an overhyped cosmic dud remains to be seen, but astronomers are planning to learn the most they can about this unusual visitor no matter what happens. › Michael Kelley's blog: "Comet ISON is Coming"